Its simple layout gives the user two options represented by a pair of dials. One controls the temperature and one controls the time. This means that even the most basic of chefs can put something in there and cook up something amazing if they put their mind to it. The 2.6L capacity is a good size for those that are looking to cook one or two meals, this size ensures that a you can get a lot of food fried at the same time, evenly and in delicious fashion. The helpful timer dial ensures accuracy when you are cooking, the cooker automatically shuts off when the timer stops, allowing precision and perfection. Unfortunately, customers have said that the food does not cook without a bit of oil, affecting how healthy the food is that you can make. Some customers have explained that their product has emitted a dangerous amount of smoke and didn’t receive much help from the customer service people when they tried to contact. 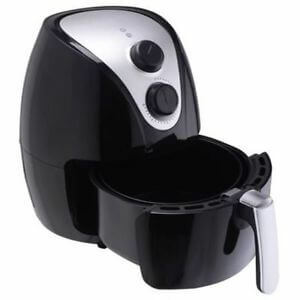 Although this Air Fryer looks like it could be a real promising product that you’d love to have in your kitchen, the reality is it probably isn’t the best. It seems to have quite bad issues that the company have not sorted out before releasing it. It has a great layout and an easy to use structure, but be warned that it is safe to consider this product a little dangerous. There are quite a few better Air Fryers on the market at this point in time, have a look around and see if you still think it is the best one you can find.